Upstream oil and gas companies are focused on driving value from digital technologies. Despite the downturn, oil and gas companies plan to invest the same amount or more in digital technologies—including cloud-enabled mobility, Big Data-powered analytics and the Internet of Things (IoT). The fifth Upstream Oil and Gas Digital Trends Survey commissioned by Accenture and Microsoft, reveals the investments upstream companies are making in digital technologies––why, when, and which ones. The annual Upstream Oil and Gas Digital Trends Survey is commissioned by Accenture and Microsoft. In its fifth year, the 2016 survey was conducted in January 2016 by PennEnergy Research in partnership with the Oil & Gas Journal. Respondents were oil and gas industry professionals including engineers, mid-level and executive management, business unit heads and staff, project managers and geoscientists from a cross-segment of the industry. Rich is a Managing Director, leading Accenture’s Global Energy Digital and Technology business. Brian Richards is the Innovation Lead for Accenture's Energy Digital and Technology business. 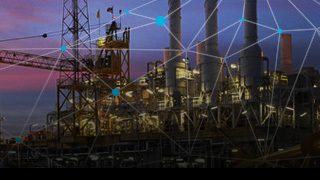 Digital technologies are adding value to upstream oil and gas companies by helping them reduce costs, make faster and better decisions and increase workforce productivity. The key barriers to achieving even more value from digital are a lack of funding, and a lack of clearly defined strategies and business cases for digital initiatives. Despite the low oil price environment, the majority of oil and gas companies plan to continue investing the same or more in digital technologies over the next 3-5 years. Oil and gas companies are turning to digital to help them manage through the current challenges in this low oil price environment. Oil and gas companies are investing in digital based on the value that can be delivered in both the short and long term. Today, the largest portion of digital investments are targeting mobility, the Internet of Things (IoT) and cloud. Over the next 3-5 years the majority of the investments will shift to focus on Big Data/analytics and IoT with the largest percentage increase on emerging digital technology areas such as robotics, wearables and artificial intelligence. Oil and gas companies are focusing their digital investments on areas where they see tangible business value. In the short term, given the low oil price, oil and gas companies are focusing these investments on areas that deliver more immediate benefits in cost reduction. This includes lowering the cost of operations through increased worker productivity with mobility, lower infrastructure costs through the use of cloud and better asset management through analytics. Over the next 3-5 years, investments are expected to shift to focus on areas that deliver the greatest long-term value, such as more comprehensive predictive operations management capabilities. Analytics was identified as one of the largest opportunity areas where digital can help transform oil and gas companies, yet most respondents felt their company did not have sufficiently mature analytics capabilities to realize the full value. The majority of oil and gas companies plan to increase their capability over the next three years. To realize the benefits that digital can create over the long term oil and gas companies need to quickly improve their capabilities, including maturity in analytics. To address this they need to work to rapidly develop in-house capabilities and leverage external market skills and platforms. Oil and gas companies are leveraging cloud and are using it to unlock the value that other digital technologies can create. Use of cloud has become mainstream for oil and gas companies. It was used mainly for cost reduction in IT infrastructure but now has become an enabler to more quickly unlock the value that broader digital solutions can provide. Oil and gas companies need to quickly adopt full hybrid cloud solutions in order to accelerate the value that digital solutions can deliver. Woodside Energy predicts the future: and it’s digital energy.